I planted our fall crops this week! The snow peas were looking good, and it went into the garden! These grew sooo fast! It germinated in about 3-4 days! Amazing! Wow, they really grew quick! I am going to plant a couple of rows of snow peas today. What else did you plant? 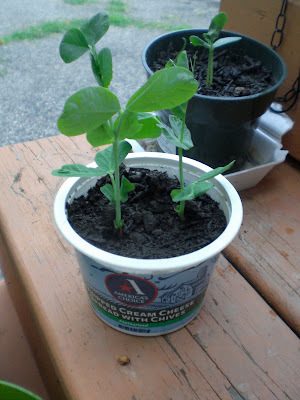 I love snow peas but for whatever reason always forget to plant them, I need to grow some for sure next year Hope yours do well, they look very healthy. That was quick - how long till you get peas then?? wow, very fast, what all did you plant? The peas look great. Can't wait to plant my fall garden next month. Good luck with them. Hope you get lots of peas.